S/Sgt Byron W. Watson (TG), Dog - "ETOE"
35 dispatched and credited missions: 196 (5 July 44), 197, 198, 199, 200, 201, 203(A), 205, 208, 209, 210, 212, 213, 220, 223, 224, 225, 227, 229, 232, 233(AS), 234, 236, 237, 239, 243, 245, 246, 247, 255, 260, 261, 262, 263 (26 October 1944). For mission dates and targets see Missions List. 1Lt Leo E. Laverty (N) Combat Tour (35 missions) completed on 26 October 1944 - 27 missions with the DuBose Crew. Flew with other Pilots on 8 missions (209, 211, 214, 216, 248, 257, 261, 263). Did not fly with the DuBose Crew on 6 missions (209, 255, 260, 261, 262, 263). 1Lt Paul R. Sandhagen (B-KIA) - Killed in Action on mission #247, 26 Nov 1944 to Osnabruck, Germany. For crew and mission details see Capt Richard F. Healy Crew page. Completed 33 credited missions - 15 missions with the DuBose Crew - 3 missions as Navigator (209, 210, 211). Flew with other Pilots on 8 missions (237, 240, 244, 247, 257, 259, 265, 277). Did not fly with the DuBose Crew on 19 missions (223, 224, 225, 227, 229, 230, 232, 233, 234, 236, 237, 239, 243, 247, 255, 260, 261, 262, 263) where other Bombardiers or Toggliers were used. T/Sgt Jesse T. Jones (E) - Completed 35 credited missions on 20 Nov 1944 - 28 missions with the DuBose Crew. Flew with other Pilots on 7 missions (240, 257, 265, 266, 268, 270, 274). Did not fly with the DuBose crew on 7 missions (224, 225, 227, 229, 230, 232, 233). T/Sgt Donald L. Kollmar (R) - Completed 35 missions on 26 Oct 1944 - all with the DuBose crew missions and no missions with other Pilots. S/Sgt Robert E. Kidd (BTG)- Completed 35 credited missions on 1 Nov 1944 - 33 missions with the DuBose Crew and 2 missions with other Pilots (238, 265). Did not fly with the DuBose Crew on 2 missions (237, 261). S/Sgt Byron W. Watson (TG) - Completed 35 credited missions on 25 Oct 1944 - 34 with the DuBose crew and 1 mission with another Pilot (238). Did not fly with the DuBose Crew on 1 mission (263). Sgt William C. Yagle (WG) - Crew size was reduced from 10 to 9 men with the deletion of the second Waist Gunner before the DuBose crew flew its first combat mission. Sgt Yagle flew 1 mission with the DuBose crew (199) where regular Waist Gunner Sgt Balint stood down. 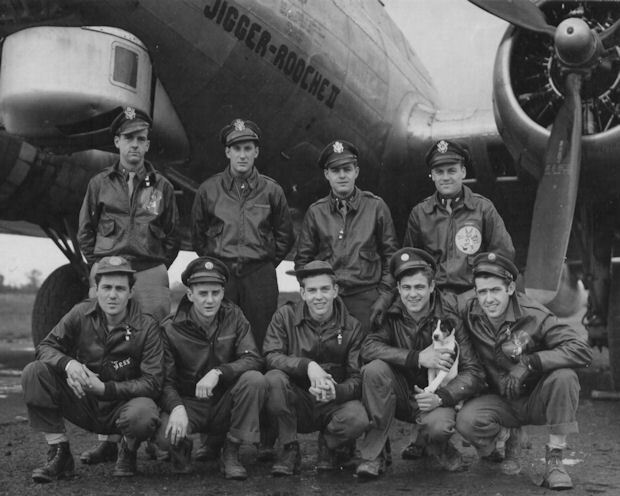 Sgt Yagle flew no other missions with the 303rd BG(H). Flying With Hell's Angels ! 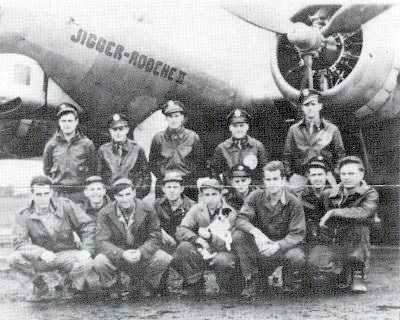 (Front) Five Ground Crew Members with Crew Chief Jimmy Stewart holding the dog "ETOE"
I suppose we should have had a premonition of the excitement to come from flying combat by an event which occurred to us at the end of Phase Training at Pyote AFB, Texas. Our last flight was a "maximum effort" cross country from Pyote to North Texas, thence down to Victoria, my home today, and back to Pyote. Our planes were fueled so that we had to stay on course or run out of gasoline. We were doing well until we neared the base and were notified that a dust storm would prevent us from landing there and we were to proceed to Hobbs, Carswell, or Roswell, New Mexico. Hobbs was closest, but we couldn't see any lights so I elected to proceed to Lubbock, Texas to the AFB there. The gas tanks were dry and I had the crew standing by to bail out. We called Lubbock to have them turn on the lights and managed to land before we lost power. About a week later they allowed us to come home; rumors had it that a number of the aircraft were lost or ditched in the lake near Carswell AFB. Media in those days didn't report tragedies. The excitement continued a few days later when we left Kearney, Nebraska with a brand new B-17, "Flying Fortress" which I was to fly to Europe. The route would be Kearney to Bangor, Maine thence to Newfoundland and across the Atlantic to Northern Ireland. The weather people told us that a cold front sitting over Iowa had holes in it and we could get through. It was a black night and I could see no holes but picked a place with the least lightning. Once inside of what must have been a tornado or a severed thunderstorm, mother nature took complete control of our beautiful plane. We were thrown up, down, and sideways with the controls completely useless. After the thing finally threw us out we proceeded on with our trip to Bangor. In Newfoundland they briefed us to fly at 15,000 feet at night so the navigator could do celestial navigation. We were to expect one small cold front which turned out to be a full blown one. The rubber boots could not keep the ice off our wings and we lost our pitot tube and the air speed indicator connected to it. I decided to descend using the artificial horizon and keep the power setting so that we wouldn't stall. At about 1,000 feet the ice melted and we broke out at 500 feet. The fun and excitement wasn't over, though, because upon our arrival at Nutt's Corner, Ireland, the airfield was experiencing a severe rainstorm. We came in on the old radio beam and almost hit the runway before we saw it. At the time I thought, this flying business is going to be a bit more exciting than I had bargained for. Many of the articles, letters and books published relate some of the tough times members of the group experienced in combat. But there were good times, too, and I would like to relate some of these. Those of us who flew missions after D-Day in 1944 (I started my tour on July 5) did not experience the massive fighter attacks of earlier missions. Although we were hit on occasion (Wiesbaden, where we lost the low squadron and our ball turret got one fighter) our major concern was flak, which was quite deadly at times. We counted over 150 holes in our plane once and came home with an 88 mm hole in the right wing which went completely through without exploding. Had it lodged in there and the timer exploded it later, I would not be writing this. I came home with a coffee can full of flak picked up from the floor of the B-17. We also experienced German fighters flying out of gun range and firing rockets through the formation, though ineffectively. The sight of a German rocket ship buzzing by a P51 had us wondering if the enemy's technology was surpassing ours. But this is about the fun times and the humor that was there, too. My first experience of this sort came as we were taken out for a practice formation flight soon after arrival at Molesworth. The new crews were assigned to the low elements of the group, of course, and taken for a ride over the North Sea. I suppose one of the tactics taken to assure we "kept it tight' was to fly very low over the waves. Although I was too busy watching the wing of the airplane I was flying on, the spray on the windshield told me there was very little, if any, clearance below; the ball turret gunner, Bob Kidd, swore the waves were hitting his turret. The there were times the group leader would take us through a thick deck of dark clouds in formation. Vertigo is your worst enemy here and it got to me a couple of times and I had to ask the co-pilot to take it until I could convince myself we were not flying up-side down. Formation flying in thick, dark clouds is exciting, to say the least. One of the sweetest times would occur when, after a difficult mission, we would fly in formation right on top of a thick deck of white, fluffy clouds. You get a feeling of exhilaration and speed at this time and 150 miles per hour feels like several hundred. When we finally dove through we never knew whether we would land in fog or rain. There was no landing system then, just some young ladies with radios placed ten miles apart to tell you which heading to take. I never could break through their Limey brogue to determine what they were saying. We had excitement, unrelated to combat, that was humorous at times in spite of danger. Once in returning home over the North Sea and as the group was letting down on the way back to Molesworth, I started to "clear" my engines at a very low altitude. There was no power in the engines which I thought were idling. There was little time to lose, but fortunately we were in gliding distance to an emergency strip on the English coast. As we went through the landing check list as we coasted dead stick about 100 feet above the sand, I called for "automatic rich" and immediately No. 1 began to purr. The light came on in my head as we buzzed the strip with all four engines at full power. The co-pilot had failed to feel the little click which tells you the mixture is in "automatic lean" and had accidently turned the engines off. Munich (we went there twice in succession) was always a maximum effort insofar as gasoline consumption was concerned. It also involved a temptation � Switzerland. I had to listen to at least a half-dozen good natured reasons why we should divert to the small neutral nation, but we continued over the Alps back to Molesworth. Then the real fun began. We lost power on one engine due to lack of fuel and I requested permission to land on the short runway. They had to tow us in � out of gas. After it was all over I realized that, at times these missions would be exciting all the way in. Soon after arrival, since we were a new crew, I was assigned a tired old clunkner F-model, with the old style superchargers. At altitude over Holland I realized that we could not control the engines � the things would run away with the slightest adjustment. An admonition from the group leader for me to get in closer convinced me to abort - something I didn't want to do and never did again. After a beautiful landing with full gas and bomb load, the CO came out to the plane and admonished me for endangering the base by landing with a full bomb load. He was right, of course, but my momentary pride in the perfect landing was smashed. We had one of the best bombardiers in the group, Paul Sandhagen, who had a top record in phase training and was targeted for lead. We took a "G" ship (radar) up for some practice bombing. On return, the co-pilot wanted to practice a landing, which I agreed to. As we were taxiing, I looked over to our right wing and realized that we would not clear an English worker's bus parked almost on the strip. Both of us hit the brakes at the same instant. Since the plane was very nose heavy from all the special equipment, it stood on its nose and smashed some very valuable equipment. It was my first and last experience of standing a Fortress on its nose with brakes. In the conference which ensued, I opened my mouth to say something, but you can imagine how far that would have gotten me. So, back to the "Tail End Charley." We flew on 15 consecutive days. The weather was good and the Eighth AF was getting after it. There were times when I was dog tired, but I always looked forward to the excitement of the next mission. I never knew what Col. Lyle, Captain Sheets, or Col Stevens thought of me, but I knew that I was a good pilot, could fly good formation, and reacted well in emergencies. When I was in error, I expected and usually received an admonition, but there was one occasion when I feared the worst, but not a word was said. 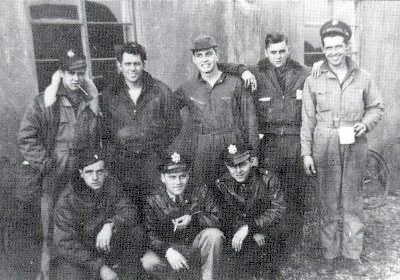 About noon on an overcast day we were called out of the tea shop, airmen's barracks and club, to fly a mission. I do not recall a briefing, but was handed a sheet of paper which showed me leading a flight of six planes joining up with the neighboring 379th Group. I suppose the navigator and bombardier knew where we were going, but I didn't. It was hard to assemble a full crew and the ground crew was busy loading fuel, bombs and ammo, but we made the start engines flare by a few minutes. After climbing through a thick cloud deck, I began to circle, but was unable to locate the lead plane. We circled in ever widening circles, but still no other planes or flares except our little group of six. I made a "command decision," we would proceed to the coast with our attached flight of planes and catch up with the rest of the formation, who surely must be ahead at this time. At the French coast, no one was in sight. Another decision, I must do something to get these people credit for a mission, so I requested bombardier Sandhagen to pick out a target. At this time he notified me that he had no bombsight. Remembering phase training, he said he could bomb "off his big toe" if we descended below 15,000 feet. We did and he clobbered the place, which was a German airfield in Northern France. At this time I was informed by the tail gunner, Barney Watson, that the entire 8th Air Force was behind us. The debriefing was the shortest ever after a mission and no one said anything. You might say that this was the one time I led the Mighty Eighth on a mission. Events seemed perilous at times, but after it was all over they became humorous. We approached the I.P. over Leipzig one clear day with the enemy fighters in the air when a jug blew on No. 1 engine. We could not feather soon enough, consequently we were stuck with a blazing engine with a windmilling prop which was throwing pieces of metal at me. The co-pilot felt we should leave the ship, but I decided to wait out the fire and try to limp on home. After the fire blew out, the prop continued to whirl which slowed us down, making it difficult to maintain altitude. I decided against trying to throw off the prop since it might damage the plane and I was right next to it. At 15,000 feet I asked Paul to find a target � we were going to get credit for this one. After bombing something, probably insignificant, we began the long perilous journey home alone below 15,000 feet and traveling slow. Suddenly, in what seemed to be open country, the entire sky turned black and the plane began to lurch from near misses. I had never seen flak so accurate and intense. You can't do much evasive action with a large airplane like the Fortress, but we turned it almost straight up on its wing and turned. Unbelievably, we flew into the clear. We felt relieved when, after landing and slowing down on the runway the errant propeller sped across the runway ahead of us. At de-briefing there was only one admonition to the crew and that was because when I asked the crew to lighten the load so that we would have fuel to get home they threw out everything, including their A-2 jackets. There were some relaxing times and entertainment on the station. One group party that I can remember the parachutes hanging from the ceiling of the hangar, the band, the open bar along with the imported females all combined to make for a wonderful time. The total population on Molesworth Station increased for a time � several days. By far the best party ever was the one at the crew tent after our 35th. Our crew chief, Jimmy Stewart, had more wonderful food, including more meat and kegs of beer, than I had seen anywhere in England. Jimmy and his crew were top notch and I always knew "Jigger Rooche" was ready to fly. This wonderful gentleman had been in Molesworth long enough to know the ropes and could get whatever we needed. I still remember the week-end passes to London and Leeds. While experimenting with the wonderful acoustics of St. Paul's Cathedral Dome in London, we looked out the window and saw a "Buzz Bomb" flying directly at us at our height. It exploded a few blocks away. It never occurred to us to be afraid. There was talk about this time of doing away with the "flak leaves," but we convinced the flight surgeon that we were indeed "flak happy" and sorely needed the rest. A wonderful week in Scotland resulted in a rejuvenated crew. Some of the happiest times for us occurred when we would ride our bicycles through the English countryside. Each small village we rode through seemed to be more interesting than the last. Of course we were hoping to "discover" some English girls, but always had to settle for some warm beer at a quaint pub and maybe eat some fish and chips. I flew my 35th mission on October 26, 1944, an eight hour haul to Munster, Germany. Although Don Kollmar, radio operator, was the only crew member to fly all thirty five with me, all the rest only missed one or two. Those who finished the day before and were "sweating us out" were Lou Droll, co-pilot; Leo Laverty navigator; and Barney Watson, tail gunner. Bob Kidd, ball-turret; Danny Balint, waist gunner; and Jesse Jones, engineer flew with us to Munster but had one or two to go. Paul Sandhagen, who was selected to fly lead bombardier, and had spent some time in Paris soon after we took over the city, was blown out of the nose of an aircraft soon after we left for home. He was several years older than the rest of us and was a wonderful friend as well as a top-notch bombardier. He is now buried in Europe. We had sober moments when other crews we knew failed to come home, especially when the staff cleared out the officer's quarters next to ours one night after a mission. Especially traumatic was the time we witnessed the pilot and copilot of an adjoining plane trying desperately to escape a burning cockpit through the side windows. The trauma of these and other events will be with us always, but there were times when we actually enjoyed our tour with the 303rd.